First, let me be plain – this is NOT the “end-all, be-all” of pirate simulations, nor was it intended to be. This is a highly detailed, multi-faceted arcade style game – realism clearly took second place to entertainment in most every respect. A small ship can dodge cannonballs. Your character can do flips during sword fights. And governor’s daughters’ display gravity defiance that truly boggles the mind. That said, this game is beautiful, and it is FUN! If you’re familiar with the original game, then you really don’t need this review. Buy this version if you loved the old Sid Meier’s, as it’s a vast improvement in every respect. But it is, at the core, the same game. If you’re not familiar, then let’s go over some highlights, shall we? In Sid Meier’s Pirates! you create a character. His looks are beyond your control, but you can select his name, special skill, and difficulty level. The introduction then explains how you came to command a pirate ship, and sets up the basic scenario for you to begin your career. How that career progresses is largely up to you – you can work as a privateer for any of the four nations represented (English, French, Dutch, and Spanish), preying on enemy shipping. You can play the pirate hunter, seeking out famous pirates and defeating them on the high seas. You can search for lost cities of gold, or for lost relatives. And, you can try and do all at once. But be warned, this game has the unique feature of actually AGING your character over time, and eventually you grow too old for such a demanding line of work and need to retire. What sort of life you retire to will depend on how successful you were with the plunder and with the ladies. That’s the larger picture, in a nutshell. Now let’s talk about the mini-games. Naturally, we have ship-to-ship combat. You can only take one ship into a fight, which you may have upgraded with reinforced siding, bronze cannons, or even 3-tier hammocks for extra crew. The combat is fast (well, fast for sea battle) and arcade like – a small ship like a sloop can often dodge the enemy’s broadsides with ease. Ship’s clearly show signs of damage (torn sails, smoke) and crewmen can even be blasted overboard and picked up again. Should the ship’s collide, a bit of sword-to-sword combat ensues (unless you’ve already pounded them into submission.) Sword-to-sword is all about timing and gaging your opponents’s intentions so you can give the proper response – a high attack requires you to duck, a low attack you jump, etc. Your options are limited, but it’s fun and challenging just the same. And the end of the duel can result in a fun little animation, such as you or your opponent being knocked overboard. I love the original Sid Meier’s Pirates!, and I love this new, vastly improved recreation. It’s both challenging and charming, and I expect will be one of those games I’ll return to time and again for a long while to come. This entry was posted in Games and tagged atari, Sid Meier by Bilgemunky. Bookmark the permalink. 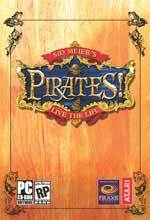 A rather fun game and as Bilge mentioned it is very much as good as the original pirates and pirates gold. Between blowing up ships, ports and just being a pirate in general you can loose track of your goal very quickly. This is not a bad thing as you have so many choices in the game. Be a pirate, a merchant, a privateer or a savior. 5 out of 5 for piratey goodness. I am afraid it is like “pirate crack”… I could not resist it, and actually wore out 2 dvd’s-scratched, etc. I also find it entertaining to pillage the french, the spanish and dutch while promoting the english expansion in the west indies. I can’t stop playing this game on the WII, it’s incredibly fun…… but it is fiercly irritating. I have reached the final villian and he is impossible to beat!! He moves tons faster than any other opponent in the game and my character doesn’t even have a chance to move before he’s beaten even though I’m frantically moving. Is it due to my guy being 66? I’ve beaten every pirate, found every treasure, etc…. I haven’t played the Wii version, but assuming it works the same as other versions (and that’s probably a safe assumption), then yes, by the time you’re 66 it’s about time to call it a day and start over – fencing in particular is VERY difficult as you get older. While I like the retirement-scale at the end to determine how well your pirate did, I don’t love having to shelve a character I’ve worked so hard to develop. Oh well.